The beer was Tripel Karmeliet; the geek was a Chinese kid who looked no older than 16, and the ladyboy…. Ah the ladyboy! She was stunning like no other girl in Krung Thep Maha Nakhon, also known as Bangkok. Or at least, stunning like no other girl I’d seen that night in Ratchada’s Talad Rod Fai, the downtown night market that happens to be among my favorite places on planet Earth, let alone the city of angels. 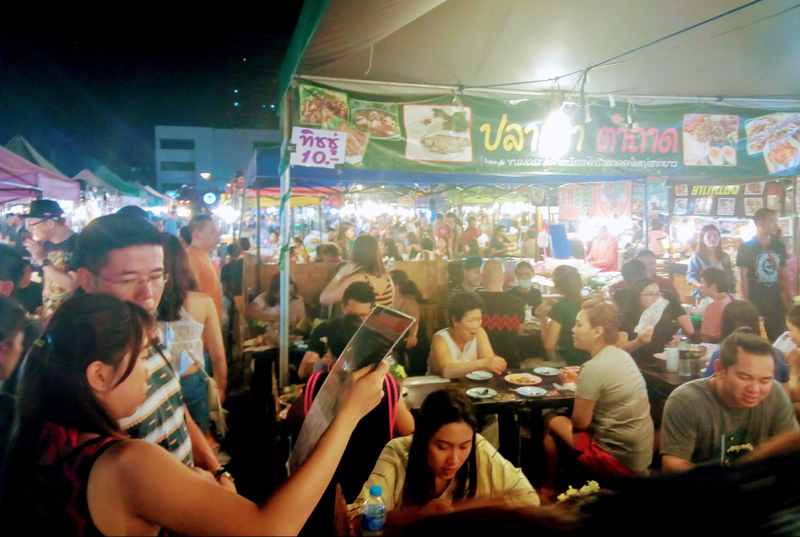 I guess it’s the proportions that do it for me: limited yet interesting shopping, fantastic open-air restaurants, cheap beer to be picked up and, on weekends, live music that I happen to like – that’s Thai Ska not hideous Reggaeton. All this in moderation, unlike Chatuchak weekend market, where every time I go I get lost once and again and eventually get a heat stroke no matter how much water I drink. Bring on some Thai Ska! But the jewel of the crown is perhaps this one beer stall that seems to sell hundreds of specialty beers, many of them European. To my amazement, the first time I saw it I spotted a bottle of Triple Karmeliet, my Belgian favourite. “Two-hundred Baht, Sir”, he answered in flawless English. The Singha was enjoyed as expected, but for some time I regretted not having bought the Triple for my friend Ek to try. Karmeliet at the Rot Fai – can it get any better? So this time I was decided to buy a bottle of Triple Karmeliet for Ek and I to enjoy as we leisurely walked the lanes trying to spot some true find at the indie designer clothes shops. Only it was pouring rain and we had sought refuge under the roof of a restaurant. “Wait for me and I’ll get you that beer” I told him, once he had ordered the grilled fish and ineluctable som tam. Seeing her as I walked down the soi toward the beer stall made my heart almost stop. Hell what a stunner. Only too tall and curvaceous to be a her, really, his big profound eyes reeking lust, no room for narak, just sexi mak mak all along. No, don´t wonder, just buy the goddamm beer, said my inner travel counsellor, a.k.a conscience by the canon. I’m not usually into mixing cultures, but I was immensely curious about how the best beer and the best food would mix. Even more about what Ek would have to say when he tasted some proper beer that was not named after an animal. But there she was, again. The tall, stunning ladyboy was sitting at the table next to ours, no more than a meter away from me as I sat. Talking distractedly to…him? A geeky, Chinese teenager –let’s assume he was of age- texting away on his mobile. My masculine mind raced for an explanation. Ek didn’t look too enthusiastic. What with enjoying the best away from its home culture. “Hey Ek….What do you think about those two?” I winked. “Yes, you know…” I whispered, “The Chinese dude with the beautiful girl…I mean…What the hell is he doing with her?” I ask, offering a naughty smile, all inviting of gossip. I pretended to ignore Ek’s facetious tut-tutting. Instead, I took one last sip from my favorite brew and, feeling rather tipsy, finally digged into my som tam.